Washington : Nearly 2,000 people marched through the streets of here to protest against the xenophobic rhetoric and immigration policies of US President-elect Donald Trump, as well as against candidates of the "extreme right" nominated for his Cabinet. As part of the demonstrations called in more than 50 cities around the country by immigrant-rights and civil-rights organisations, nearly 2,000 people protested on Saturday in the US capital, under the slogan "We're here to stay", Efe news reports. 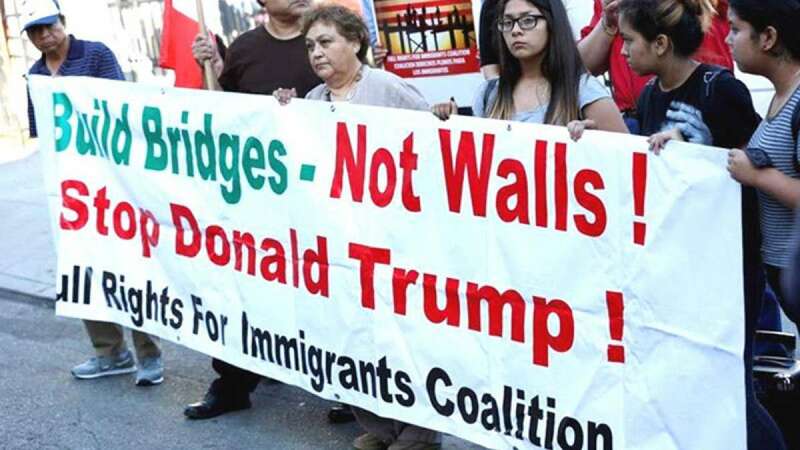 After a knock-down, drag-out electoral campaign, during which Trump threatened massive deportations, associations that fight for the rights of the undocumented have united to defend their place less than a week before the billionaire takes office. Among the protesters' chief demands Saturday was protection for the young undocumented immigrants known as "dreamers" from being deported in case Trump revokes the executive orders President Barack Obama instituted to keep them from being sent back to their countries of origin and which allow them to obtain work permits. Monica Camacho, an undocumented young woman who came to the US from Mexico in 2002 when she was 7 years old, and who joined the protest to make it clear that despite being afraid, she and others in her situation will keep fighting. "This is our home. As immigrants we give a lot to give this country. Our parents brought us here when we were little, and it is also the country of our parents," she said. "The community is worried, it's scared, but we're going to keep up the struggle anyway. There's always the fear of what can happen but we're sticking together," the young woman said.